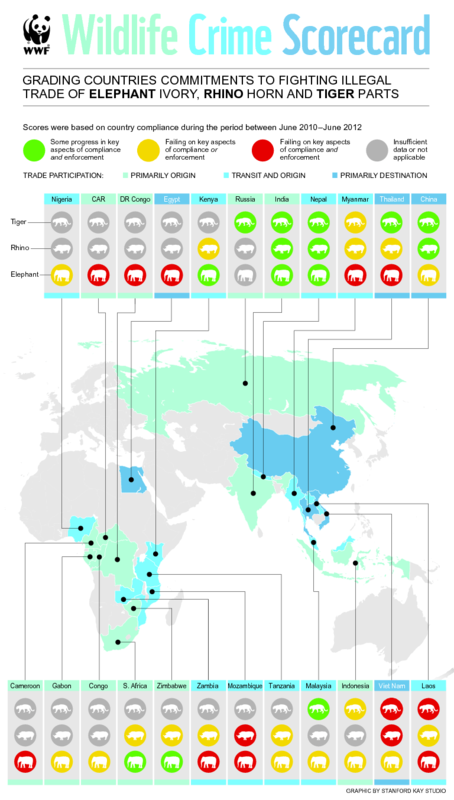 WWF has produced an infographic showing the commitment from countries to stop illegal wildlife trade, focusing on countries from Asia and Africa with the highest levels of illegal trade in elephant ivory, rhino horn and tiger parts. The scorecard was produced to coincide with the 62nd Standing Committee meeting of CITES, the international endangered species trade convention, and evaluates each country’s progress since the last meeting. It measures progress towards compliance with and enforcement of CITES commitments for the three species groups. International commercial trade of elephants, rhinos and tigers – and their parts and products – is almost universally prohibited by CITES, however the enforcement of this restriction remains weak. Illegal trade in ivory, rhino horn and tiger parts is of major conservation concern.